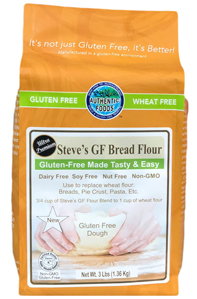 Steve’s GF Bread Flour Blend is the flour that will revolutionize gluten-free baking. For the first time ever, you will make a true dough with the characteristics of wheat dough-without gluten! The dough can easily be shaped, twisted or molded into the most intricate breads or baked goods During proofing the dough will double or triple in size, which means no more heavy batter when making bread, rolls, etc. 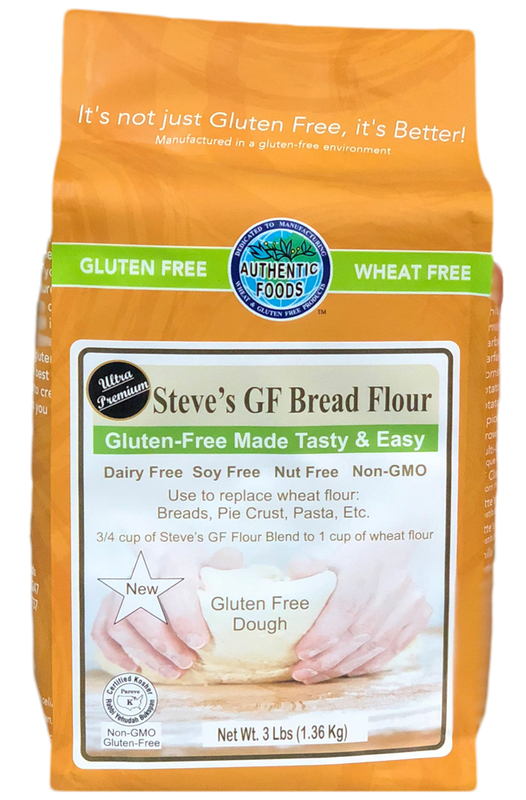 Steve’s GF Flour Blend is used just like normal flour for baking. It is ideal for breads, pretzels, cinnamon rolls, hamburger buns, dinner rolls, challlah, English muffins, crackers, breadsticks and more with taste and texture that rivals wheat. For more recipes click here. Back in July I called a little after closing time to ask about nuts in your baking goods. I was feeling dismayed and bewildered after a very recent nut allergy diagnosis in my 3 year old. After 5 years of successful GF living, taking out the nuts (particularly almond flour) seemed like too tall a task. You took the time to talk with me about your products and your experiences with diet modifications over the years. At the end of the conversation I was feeling hopeful and upbeat and ready to start baking. We have enjoyed all of the products we got. I had been putting off making bread with Steve's bread mix because I wanted the taste and texture of the kids' long-favorite bread to have faded a bit in their mouths and memories. I needn't have worried. The challah bread I took out of the oven at 1 pm is almost gone. My kids, sister and mother are all clamoring for more. I finally feel inspired to start baking again. Thank you for your products and your kindness. They have both been appreciated here!